Why Watch it Today? : Agatha Christie died on this date in 1976. 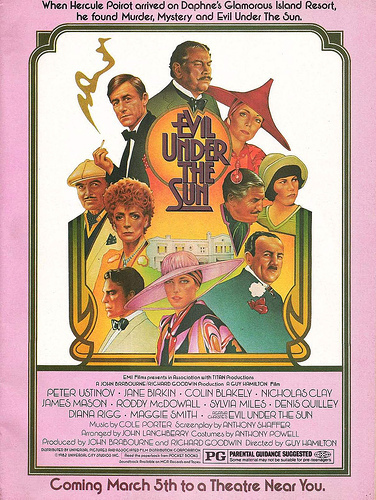 Evil Under the Sun is one of the better adaptations for her work for the cinema, with an excellent, star-studded cast, a beautiful location, and an intriguing mystery. This entry was posted in Adaptation, Based on a Book, Crime, Detective, Movie of the Day, Mystery, Period Film, Sequel, Thriller, Whodunnit and tagged Adriatic, Britain, diana rigg, drug smugglers, EMI Films, Guy Hamilton, Hercule Poirot, heroin, island, James Mason, Jane Birkin, jewel thieves, Maggie Smith, murder, Peter Ustinov, resort, Roddy McDowall, Sylvia Miles. I love the Suchet Poirot, but there’s something great about the run of Agatha Christie mysteries from the 70s into the 80s. I think it’s just the gloss (and high caliber casts) that a theatrical release brought with it. I also haven’t seen the most recent Suchets; we’re stuck around 2006 or so right now.